REDWOOD CITY, CA (December 13, 2017) —The largest U.S. companies are engaging in more transparent disclosure practices, according to a new report from Equilar, Corporate Governance Outlook 2018, which features commentary from Hogan Lovells and Donnelley Financial Solutions. More than half of the Equilar 100, a sample of the largest U.S. companies by revenue, file information to the SEC regarding their investor engagement, board evaluation and CEO succession policies. While some of those disclosures are straightforward, boilerplate information, more and more companies are including specific details about these practices in their proxy filings. 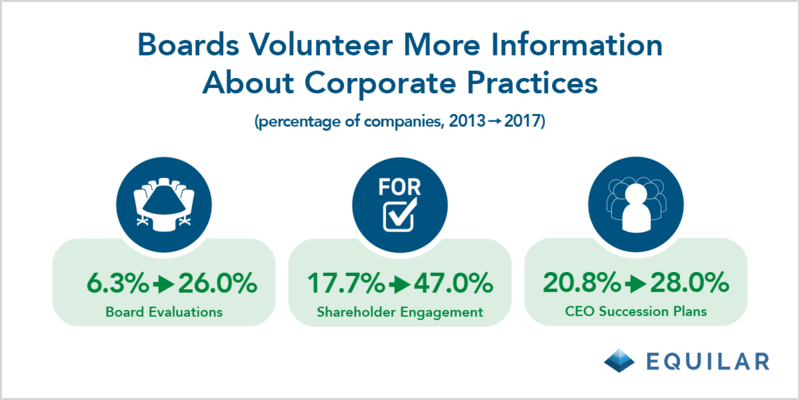 Over the past five years, the percentage of companies that detail shareholder engagement practices or outcomes from investor meetings has increased from 17.7% to 47.0%. Meanwhile, more than one-quarter of Equilar 100 companies disclosed specific details about CEO succession planning (28%) and board evaluations (26%). Both figures represented steady annual increases over a five-year period. Alex Bahn, John Beckman, Alan Dye, Martha Steinman and Lillian Tsu, all partners with Hogan Lovells, also contributed commentary to the report. The total amount of shareholder proposals in the Equilar 500 decreased from 400 in 2016 to 352 in 2017—however, social and environmental proposals increased in that time frame. Roughly half of all Say on Pay proposals in 2017 received over 95% approval from shareholders—99% of all proposals passed with majority support, with only five Equilar 500 companies receiving less than 50% shareholder approval. Zero companies in the Equilar 500 disclosed a CEO pay ratio ahead of the required rule for 2018. Of the 426 companies in the Equilar 500 that granted performance awards to named executive officers, 204 did not use TSR as a performance metric in 2017. Return on capital/return on invested capital/return on equity (ROC/ROIC/ROE) was the most common metric at these companies, appearing 84 times in executive awards at companies that forewent TSR. Please click here to request a copy of the full report. Donnelley Financial Solutions (NYSE: DFIN) provides software and services that enable clients to communicate with confidence in a complex regulatory environment. With 3,500 employees in 61 locations across 18 countries, we provide thousands of clients globally with innovative tools for content creation, management and distribution, as well as data analytics and multi-lingual translations services. Leveraging advanced technology, deep-domain expertise and 24/7 support, we deliver cost-effective solutions to meet the evolving needs of our clients. Download the 2017 “Guide to Effective Proxies” from Donnelley Financial Solutions. Visit https://info.dfsco.com/Proxy_Guide for more information. Straight talking. Thinking around corners. Understanding and solving the problem before it becomes a problem. Performing as a team, no matter where we’re sitting. Delivering clear and practical advice that gets your job done. Our 2,500 lawyers work together with you to solve the toughest legal issues in major industries and commercial centers around the world. Whether you’re expanding into new markets, considering capital from new sources, or dealing with increasingly complex regulation or disputes, we help you stay on top of your risks and opportunities. Visit www.hoganlovells.com for more information.